The newly planted berm at the intersection of Azalea Way and the Loop Trail. Our volunteer units play an integral role at the Arboretum—raising vital funds, participating in Foundation-sponsored events, leading tours at the Japanese Garden, and more. Unit 26, the Lillian McEwan Unit, based on Bainbridge Island, made a generous gift of $12,500 to the Foundation this year, and the money has just been used to fund a major new planting on Azalea Way. Some of the money will also be used to sponsor our 2019 Opening Night Party at the Northwest Flower & Garden Festival. Unit 26 has existed for more than 60 years and has made many donations to the Arboretum over that time. In the past, the Unit would host an annual plant sale to raise funds. Two years ago, Unit members decided to host a “spring social and fundraiser” instead, and they raised $10,000 to help fund cultural programs at the Seattle Japanese Garden. This year’s event, hosted by a Unit member in their Bainbridge Island home, included a light reception, paddle call, and live auction—featuring guided tours of Heronswood and other treasured regional gardens. 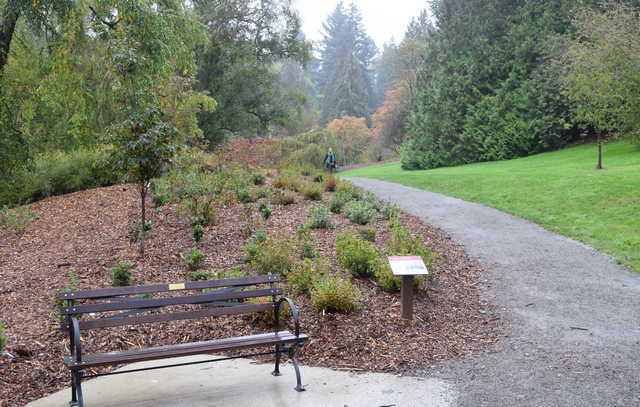 Of the $12,500 donated by the Unit to the Foundation this year, $7500 went towards the creation and planting of a large bed of azaleas and small trees on the south end of Azalea Way, where the historic promenade intersects with the new Arboretum Loop Trail. Because of problems with poor soil and drainage at the site, lots of new top soil had to be brought in to construct a berm that would allow the plants to thrive. More than 80 azaleas (comprising seven different varieties) were planted to create a new display that will dazzle visitors entering Azalea Way via the trail in spring. Other plants in the bed include two hybrid dogwood trees and a large East Asian azalea donated by Dan Hinkley (who led the Unit’s tour of Heronswood this year). A view of the new bed looking south towards the Loop Trail. 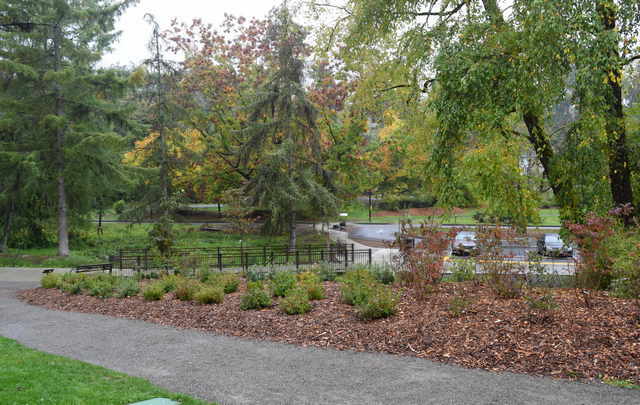 To support future maintenance of the new planting bed, $2,500 of Unit’s donation is being used to fund the Garden Stewards program, which recruits volunteers to help Arboretum horticulture staff care for collections on Azalea Way and Pacific Connections. The remaining $2,500 from the donation is being used to sponsor our biggest fundraiser of the year—the Opening Night Party, on February 19. Thank you to Unit 26 and to all of our volunteer units who give so generously in support of our mission to sustain this unique Arboretum!